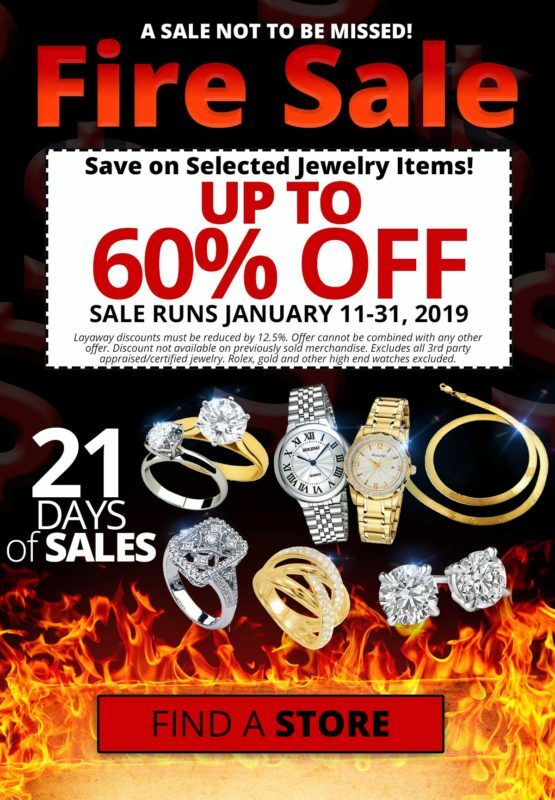 At All BC Stores: Up to 60% off Jewelry Through Jan 31, 2019! A sale not to be missed. FIRE SALE! Save on selected jewelry items! Up to 60% off. Sale runs January 11- 31, 2019. Layaway discounts must be reduced by 12.5%. Offer cannot be combined with any other offer. Discount not available on previously sold merchandise. Excludes all third party appraised/certified jewelry. Rolex, gold and other high-end watches excluded. This entry was posted in Latest News, Promotions at all BC Pawn Shops. Bookmark the permalink.